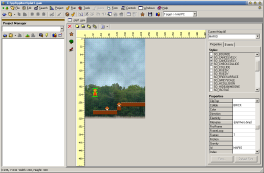 PPL 1.20 comes with a completely redesigned Visual Form Editor and Game Level Editor. 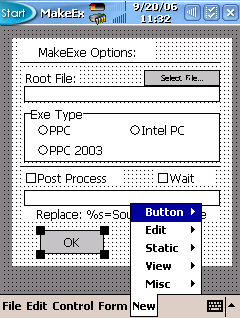 The design time display is an exact representation of what your runtime form will look like. You can now directly drag controls from the list to your form. PIDE in action. The PIDE is the PPL IDE on the desktop computer. 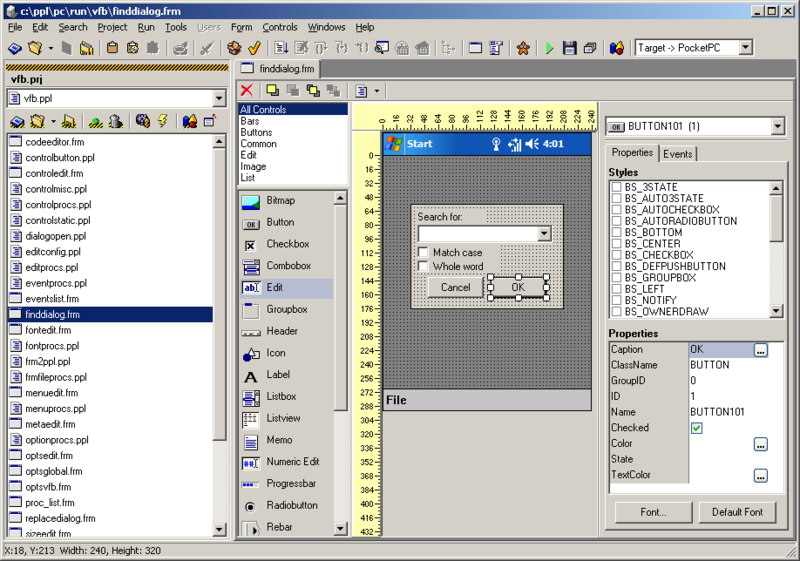 PIDE editor. 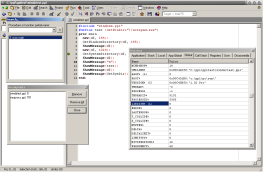 Edit your source code with full syntax highlighting and source code formatter. 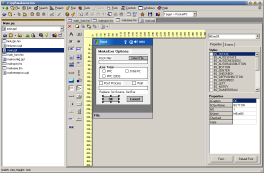 The Visual Form Builder offers an easy to use interface with a simplified event handling system. 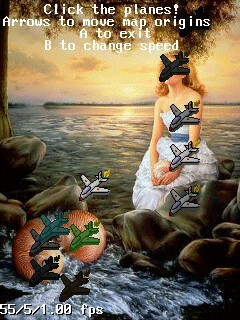 Create wonderful games visually without even a touch of programming. The Game Level Editor allows you to create games visually by assigning properties to objects without even adding a single line of code. 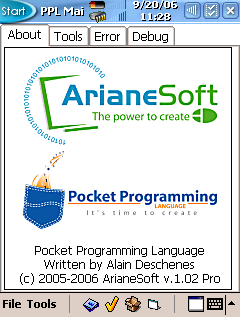 The main interface for PPL on the PocketPC. It has been written entirely in PPL and the source code is provided. Write programs on the road. 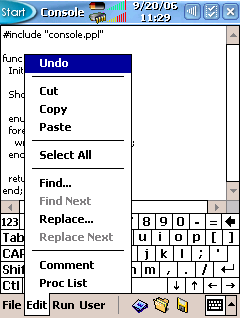 The editor on the PocketPC. 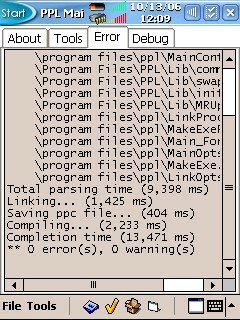 It has been written entirely in PPL and the source code is provided. Create nice forms on the road. 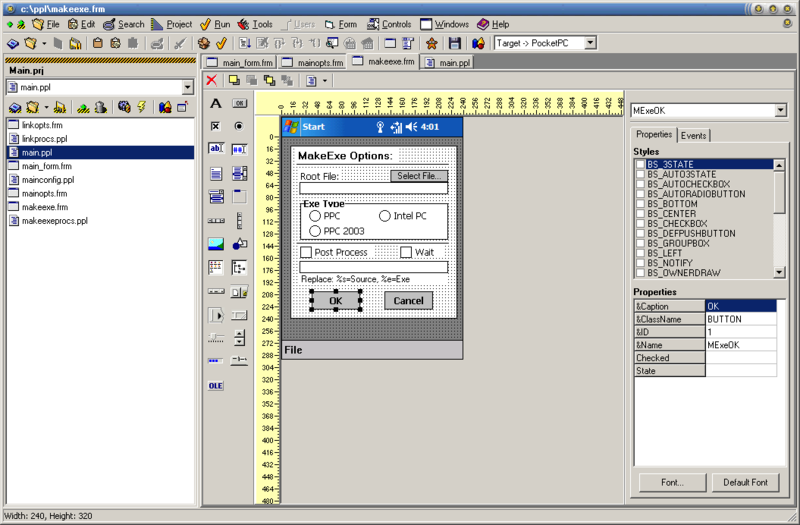 The Visual Form Builder on the PocketPC. 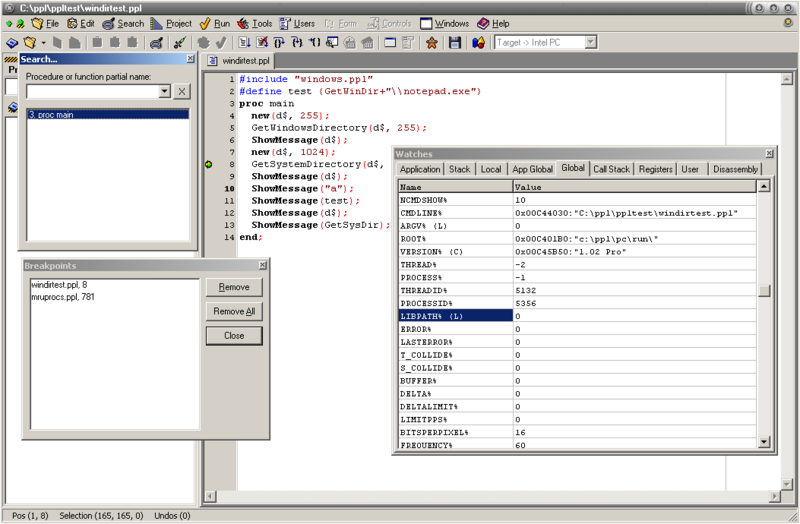 It has been written entirely in PPL and the source code is provided. Only you imagination is your limit now. 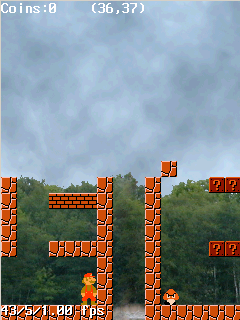 Write games with full 2d physics enabled. No extra coding is needed. PPL simplifies your task. The GameAPI comes with a particles engine that does all the work for you. 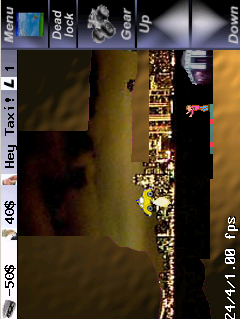 Write you own games for the PocketPC. The powerful GameAPI allow for easy game creation in minutes. Recreate classics for the PocketPC. 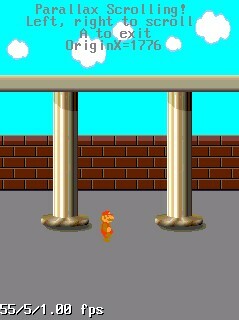 Here is a platform game very similar to mario that was done in a very short time. 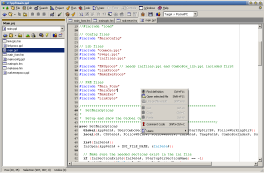 Create fast games for the PC and the PocketPC. No need to change any code, PPL is 100% cross-platform. 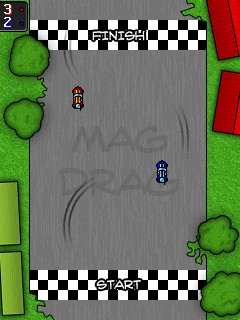 Support for dynamic lighting and tinting of sprites is as easy as setting a map light level and a light radius. 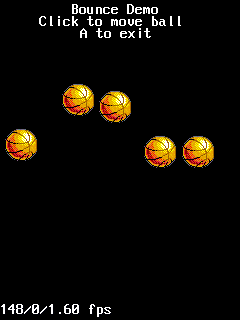 Sprites will light up according to their position within the light radius. You can set multiple sprites to spread light for torches, candles�or lamps objects. 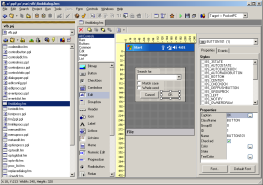 Get a complete report�with statistics on compiling�even on the PocketPC. Write side scrollers in minutes using our sets of layers functions in the GameAPI. Set the scrolling rate of each layer to simulate depth of field. Don't worry about any details the scrolling will be done automatically at the right rate. 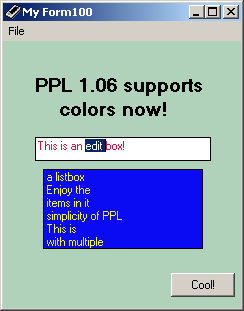 Starting with PPL 1.06, you can create visual forms that look way more entertaining. 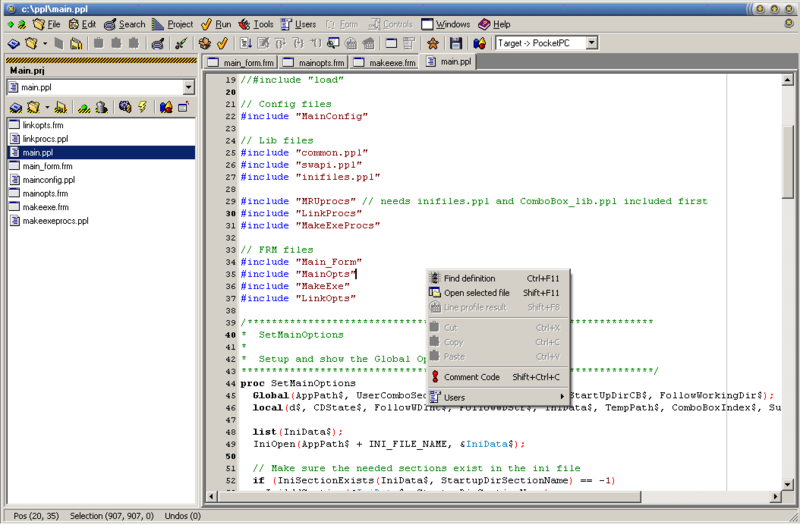 Add colors to your world by changing the background colors and text colors of controls and forms.